Join us for Crime Safety Transportation & Safety meetings if you have something you'd like to discuss or learn more about or volunteer. The committee meets quarterly on the 3rd Monday of the scheduled month at Walker Health Services, 3737 Bryant Ave, (South Door) at 7 pm. We invite you to the next CSTN Committee meeting. Click here to send a blank email that automatically signs you up to receive regular email updates from your 5th precinct Community Crime Prevention Specialist, Jennifer Waisanen. If you want to know about many crimes as they occur on your block, being a block leader is the best step. Contact your Crime Prevention Specialist (CPS) to find out if your block is organized and/or how to get involved. Block leaders also get priority seating at 3 very informative workshops in the city as a thank you for their help. National Night Out is on the 1st Tuesday of August. 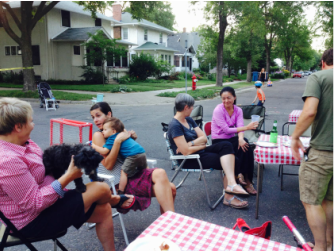 Several blocks parties were held in East Harriet in the past years featuring pot luck dinners, music, bouncy houses, games & activities. This nationwide event encourages residents to get to know their neighbors as a way to encourage crime prevention.